On February 16-17, The Childs Dreyfus Group exhibited alongside Kimball Hospitality/Office at the NAA Student Housing Conference at the Hyatt Regency Chicago. 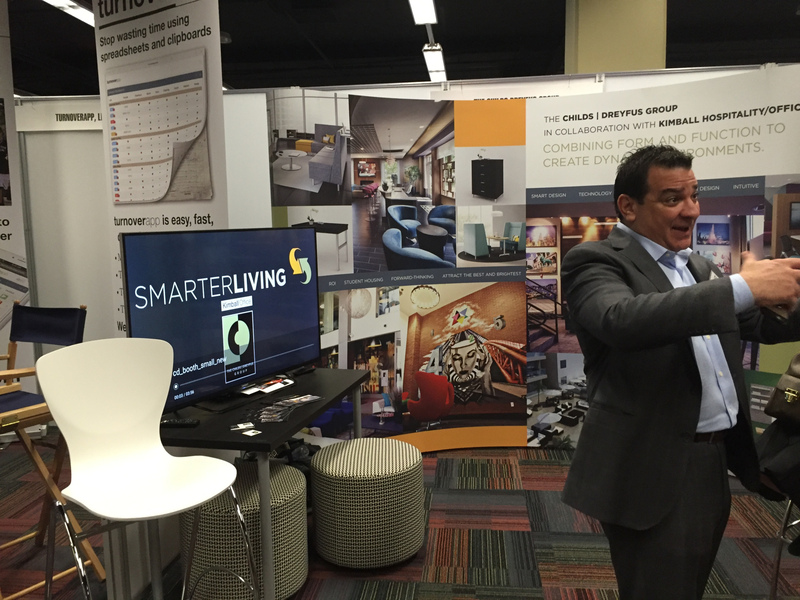 The event gave both companies the opportunity to showcase their latest joint venture, Smarter Living. Smarter Living is all about multi-functional designs and quality craftsmanship. From concept to completion, its mission is to create modern spaces that are not only comfortable, but also cutting-edge. The exhibit featured several projects that the company has recently worked on, showcasing the high quality design and products offered by Smarter Living. Overall, the conference proved to be a success in terms of unveiling the venture. The conference also served as a prime opportunity to showcase the numerous student housing projects Childs Dreyfus has completed and is currently working on. Some of these include: University of Illinois Urbana-Champaign, Ohio State University, Florida Atlantic University, Florida State University, Syracuse University, Mississippi State University, University of South Carolina, and University of Delaware.